This advice could easily be part of the executive summary for a new report released last week. Investing in What It Takes to Move From Good to Great is a summary of research on supporting teachers throughout the career continuum. The report outlines necessary supports to help teachers grow as professionals during four critical career stages--preservice, novice, career and teacher leader. The “where you been and with who” makes up the substance of the recommendations. Wherever teachers are in their development, they can benefit from these recommendations, taken from research collected from State Teachers of the Year and Finalists and nearly 5,800 Nationally Board Certified Teachers (NBCTs). Novice Teacher. 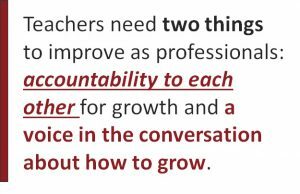 As we begin our careers in the classroom, all fledgling teachers would benefit from mentorships--formal or informal--that challenge us to reflect and improve daily. 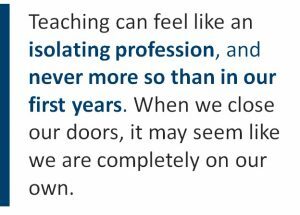 Teaching can feel like an isolating profession, and never more so than in our first years. When we close our doors, it may seem like we are completely on our own. But strong relationships with colleagues can affirm our place in the classroom while pushing us to get better. As a novice teacher, I had the support of generous colleagues--especially my principal whose early encouragement gave me the confidence to pursue a less traditional approach to classroom teaching. Without this informal mentorship, I might not be a teacher today and certainly not a State Teacher of the Year. My situation is not unique. Early support is critical to keeping teachers in the classroom and growing as professionals. Career Teacher. As I have entered the third phase of my teaching career, I have begun to rely on outside organizations to supplement my growth as a teacher. Professional organizations like NBCT, NCTE and NNSTOY have helped me to continue to improve my practice. In fact, NNSTOY’s annual teacher leadership conference in Washington, D.C. this July will provide these types of opportunities for growth. There, teachers will learn from other great teachers about how to use their own expertise to improve education, advocate for their students and the profession, and influence policies that support all students. These groups have accepted me into a community of professionals and inspired me with fresh ideas and new ways of approaching my practice and content. It is valuable for career teachers to pursue these certifications and memberships as a next step in their trajectory. They should be funded as a matter of course. Any affiliation that keeps us connected to our content pays dividends with our practice. This year, I took a poetry class through Harvard’s Graduate Extension School. It was a lot of work, an amazing experience, and I have been re-inspired to teach poetry. I have taken writing classes, I have attended summer seminars, and I have even read grants for the National Endowment for the Arts. All of these experiences—not necessarily directly connected to my classroom—have improved my practice. In the classroom, I have partnered with other organizations that have enabled me to meet some of my favorite living writers. With 826DC, I have met Dave Eggers and Edward P. Jones. With PEN/Faulkner’s Writers in Schools, I have hosted Karen Russell, Luis Urrea and, yes, Mitchell Jackson in my classroom. I didn’t partner with these organizations to meet great writers, but meeting them has kept me inspired with my content and challenged me to continue to improve my practice. 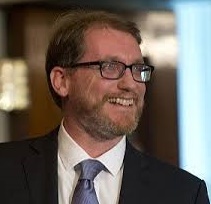 The Teacher Leader. I don’t identify as a Teacher Leader yet, but the report makes plenty of common sense recommendations for this stage as well. To complete the circle, teachers who have learned the lessons of the classroom should be encouraged to leverage their expertise as formal or informal mentors. They should have supports to serve as trainers for the next generation of teachers whether inside their building or in local colleges and universities. They can even ply what they know in—gasp—policy setting environs that often may not pay close attention to teacher expertise. 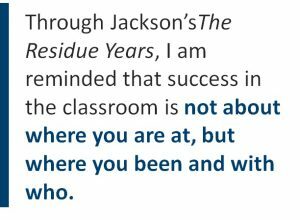 Through Jackson’s The Residue Years, I am reminded that success in the classroom is not about where you are at, but where you been and with who. These supports and experiences have added to my success in the classroom. With targeted support and advice from teachers, we can learn to support classroom teachers more effectively. The recommendations are there for each stage of the career continuum. Now we’ll see who’s paying attention.